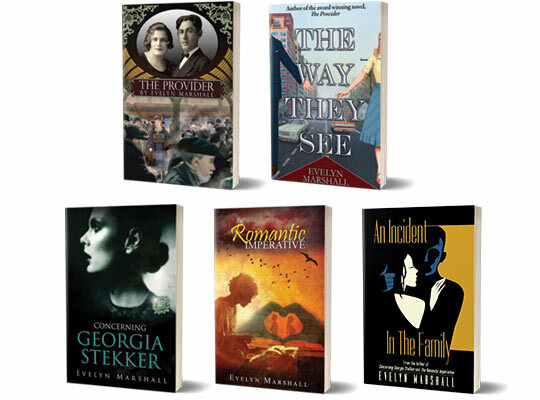 Consider my five novels for wonderful holiday gifts. Some can be ordered both as digital and paperback. Others in only one form. Easy. Fast. Young couple in love come upon a misconception of each other and go their separate ways into unintended lives for twenty-five years, then meet again. Beginning excerpt published in JewishFiction.net for their once yearly issue, Sept 2017. Enjoy shopping on my website: EvelynMarshall.com and on Amazon! Before I start writing any novel, I always have a good general idea of the ending. I don’t know exactly how I will get there (which is half the fun), and I always meet with surprise upon surprise, but I generally come to the conclusion that isn’t far from what I originally planned, but it’s more embellished, more complicated. If I am writing correctly, then all the ends tie together. ... because it presented a beginning situation and I had no idea how it would resolve itself. After I finished the novel, I said, "Now Evelyn, what have you written?" And what I discovered was enlightening. ... and I saw that it was her novel. The character Tamma drove the plot forward in her search for answers and a happy life - she was not the main character. Rachel was. Read the novel for yourself. You'll see how it worked. I ran this argument for and against cannibalism in 2014 when I had the old newsletter. The argument is cogent and bears repeating. Now, as I before hinted, I have no objection to any person's religion, be it what it may, so long as that person does not kill or insult any other person, because that other person doesn't believe it also. But when a man's religion becomes really frantic; when it is a positive torment to him; and, in fine, makes this earth of ours an uncomfortable inn to lodge in, then I think it high time to take that individual aside and argue the point with him. And just so I now did with Queequeg. "Queequeg," said I, "get into bed now and lie and listen to me." I then went on, beginning with the rise and progress of the primitive religions, and coming down to the various religions of the present time, during which time I labored to show Queequeg that all these Lents, Ramadans, and prolonged ham-squattings in cold, cheerless rooms were stark nonsense; bad for the health; useless for the soul; opposed, in short, to the obvious laws of Hygiene and common sense. I told him, too, that he being in other things such an extremely sensible and sagacious savage, it pained me, very badly pained me, to see him now so deplorably foolish about this ridiculous Ramadan of his. Besides, argued I, fasting makes the body cave in; hence the spirit caves in; and all thoughts born of a fast must necessarily be half-starved. This is the reason why most dyspeptic religionists cherish such melancholy notions about their hereafters. In one word Queequeg, said I, rather digressively; hell is an idea first born on an undigested apple-dumpling; and since then perpetuated through the hereditary dyspepsias nurtured by Ramadans. "No more, Queequeg," said I, shuddering; "that will do;" for I knew the inferences without his further hinting them. I had seen a sailor who had visited that very island, and he told me that it was the custom, when a great battle had been gained there, to barbecue all the slain in the yard or garden of the victor; and then, one by one, they were placed in great wooden trenchers, and garnished round like a pilau, with breadfruit and cocoanuts; and with some parsley in their mouths, were sent round with the victor's complements to all his friends, just as though these presents were so many Christmas turkeys. After all, I do not think that my remarks about religion made much impression upon Queegueg. Because, in the first place, he somehow seemed dull of hearing on that important subject, unless considered from his own point of view; and in the second place, he did not more than one third understand me, couch my ideas simply as I would; and, finally, he no doubt thought he knew a good deal more about the true religion than I did. He looked at me with a sort of condescending concern and compassion, as though he thought it a great pity that such a sensible young man should be so hopelessly lost to evangelical pagan piety. If your appetite is increasing, then read this cannibal story. FYI: Concerning Georgia Stekker turns spooky! Where do writers get their ideas? Jerry Seinfeld was asked that, being a comedian. Felix Unger (“The Odd Couple”) was asked that, being a journalist. In my last blog (Oct. 14), I mentioned that Henry James was sitting across the dinner table from a father/daughter couple who inspired him to write the novel “Washington Square” that was turned into the film “The Heiress”. So where did I get my idea to write THE ROMANTIC IMPERATIVE? I’m glad you asked. Marv and I were in New York, at the Metropolitan Museum of Art, in the gift shop. You would agree that museums have fabulous gift shops. I wandered over to a wall covered with postcards showing great paintings. Suddenly my eyes fell on a scene painted by the French painter Edouard Manet, titled “Interior of Arcachon, 1871” (15/1/2 x 21 inches). The composition was of an old mother and a dilatant son sitting at a table. She was looking out the window, and he was smoking his cigarette and gazing at her. I said to myself, I know these people. They are rich and colorful. I want to write their story. For those of you who have already read the novel THE ROMANTIC IMPERATIVE, you can easily guess that here are Ardita And Dorsey Danzie. For those of you yet to read the novel, you will have this painting in mind. Perfect. People think that writerly seeds automatically sprout from travels. Not for me, and I’m very much traveled. Travels are respites. In fact, I never have insomnia on trips. Only when I get home and again think about my project does the insomnia machine revv up. "From the cover of this book, I didn't quite know what to think this story would hold. I actually truly enjoyed the characters and their interactions, they became real and interesting. This book has an unusual writing style and I loved it. It flows, by the third chapter I was hooked. I also enjoy a book with a very unique story line." I'll give you the SEED for this novel. Are you ready? I was the girl at the party who was left stranded at the table. I so much like hearing a reader tell me how much she/he is enjoying my blogs. Choose Fame or Anonymity. Be careful which you choose. If you are a writer, you will choose anonymity. It gives you space to breathe and think. You can wander the world and observe human behavior. You can isolate yourself and imagine stories. No one gets in your face. John le Carre, the master spy writer, hides out in his isolated beach top house. 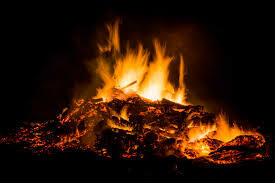 Henry James (and other famous writers) burned all of his letters and work papers, protecting himself from the “predators”. Recently a biographer, James Atlas, wrote an arrogant moralistic book about Saul Bellow, the Nobel Prize winner for Literature in 1976. Woah! The biographer should have walked in Bellow's moccasins for three days and then asked himself, Would I have done better in like circumstances? Surprise: Bellow is a human being. A biographer serves a good purpose in revealing an author’s themes and sources. But to invade an author’s inner sanctum and pontificate is going too far. Henry James dined out at other people’s homes half the nights of his life. He was a famous raconteur; his monologues were highly anticipated. One night he was at a dinner table sitting opposite a very rich, stern aristocratic father and mild, plain daughter. James, the raconteur, fell silent in observation. Guests respected his sudden silence; obviously he was observing, taking in, his mind was at work. No one bothered him. But James' inner sanctum was not at work. Here was a gift from the outside world. And James simply wrote it. It became "Washington Square" which became the film "The Heiress" (Olivia de Havilland, Ralph Richardson, and Montgomery Clift). My most recent book, "An Incident in the Family" was also a gift. I simply wrote it and stopped. If you read it knowing that its original title was “Tamma Millerman’s Inheritance”, you will see my mind at work. Thinking about a novel in progress is so fascinating and complicated, loaded with so many possibilities, that the mind cannot turn off. Consequently, insomnia springs up as an unwelcomed monster. Curses and hot oil on the Black Dragon. i'm back in my own bed, and here comes the Black Dragon. It's an all-nighter. Do you have any idea what it's like to start a new day after being up staring into the darkness for 8 hours? Here is a photo of me after completing THE ROMANTIC IMPERATIVE. About every 3-4 nights, I do get a good night of sleep because my body can't take it any longer. So you want to write your novel? Go ahead. OR, you may want to read one of my short stories, "The Debt," about a Jewish man who wants to/and marries a gentile woman (click the button below and enjoy!). This was honored by one of the most prestigious literary journals, Glimmer Train. Click to Read "The Debt"
Evelyn's Blog for Sept 30, 2017 - THE SCOOP ABOUT WRITERS' DISCIPLINE! My husband Marv and I were attending a theatre performance at our regular favorite theatre (South Coast Repertory). We have had season tickets for most of our married life. The other day I watched a film about Jackson Pollack’s life. He had no need of disciplne. He always wanted too paint. I’m certain the same was true for Michelangelo, and the whole gang. And of course, A. A. Milne, author of the Winnie the Pooh books. WRITERS BLOCK? What is it? Answer: I think Writers’ Block is NOT an absence of ideas per se, but rather coming upon an idea that arouses your passion to start the motor and go for the ride. 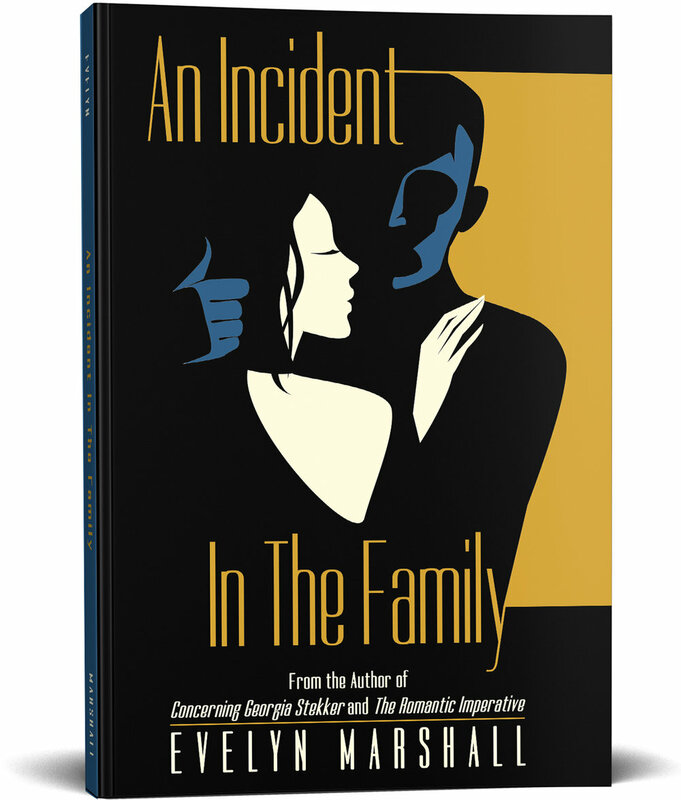 AN INCIDENT IN THE FAMILY is now on my Amazon site in paperback. Please click to order. Evelyn's Blog for Sept 22, 2017 - "INCIDENT" - WHAT ARE ITS CHANCES? Click the image above to view it larger. My excerpt from "Incident" was just published this month in JewishFiction.net. Take a look at the setup, and the excerpt. You'll be proud of me. My printer, LightningSource, notified me that paperback copies are now available. So I mailed 12 copies to the National Jewish Book Awards contest, ending October 3 - for consideration. INDULGE me, please: I need to CONFESS something to you. I have written seven novels, a series of short stories, a screenplay, AND I always was mindful of their structure and progression. However, "Incident in the Family" had a mind of its own. I held onto the novel as to the tail of a racing tiger. One chapter shot on to the next, I came to the end, and stopped abruptly. Either it is a WEIRD one-of-a-kind novel, or I have shifted to a new form of novel writing. This latter phenomenom occured with John LeCarre. He wrote one novel very, very fast and said, "It's a once and a lifetime experience." The film director made damn sure not to disappoint the audience with the appearance of a grotesque Quasimodo in "The Hunchback of Notre Dame." All year long, the literary magazines post their short story contests. To win a contest over thousands and thousands of entries being read by bleary-eyed reviewers who are looking for any short cut reason to eliminate an entry, is prodigious for the author. To win more than one contest or two or five contests is even more prodigious. The contest offers the names and bios of the judges and the previous winners. Their credentials reveal they are members of the same clubs, having won all the same honorable honors. With that in mind, I just received an announcement about the upcoming Zoetrope short story contest. Included was the previous winner’s story. I began to read the winning story and realized it came from the point of view of a little gal, a dwarf. She herself used the word, “Freak”. The story was well written; that goes without saying. The plot reveals that the little gal discovered the photographer to be more freakish than she herself was, and our dwarf was in shock. I thought, no one could win against such an entry. The more offbeat, the more freakish, the better the chance of winning. I captured this piece of in formation early in my career. Here is the vita: my novels class instructor announced a short story contest for the college Drury Award for a short story. I wrote “Through the Years”. After the instructor read my story, he said to me in earnest, “You must enter this in the college contest.” I did. Another member of the class, a self-pronounced pre-med student, also entered a short story. He wrote a vivid account of an autopsy. He won the contest. I don’t remember his story, but I remember the description of pulling the skin down from the face. I don’t know if the author ever went on to medical school. I do know that he did not continue as a writer. He stopped too soon. The medical field is loaded. Why, every single one of us has a story inside us every bit as worthy of the grotesque. We can all be writers, at least once. My story "Through the Years" was consequently published in a literary anthology and later became part of my novel "The Provider". My mother is now one hundred years old. Each week I visit her at the retirement manor. And we talk of the past. My mother is proud that she can support herself here in a private room, and be surrounded by her own things, some of which once belonged to Dolly. We talk of Dolly. My mother did like money. She liked to work for it, count it, save it, and get her dollar's worth when she spent it. She received pleasure in her good management of it and she respected its power, especially its power to transform a person's life. She was always interested in knowing who had achieved the American Dream. My father was not a good provider. My parents came to America separately as young Russian immigrants in 1922, and fell in love. Yet my father remained no better than a struggling immigrant all the days of his life. So my mother worked at her sewing machine in the garment district, and she became the chief family provider. My mother is the most un-frivolous person I know. Her life became so pragmatic that she lost, for the most part, her ability to play, to be childlike. Unless her fascination with thrift and money well spent were her game. But Dolly never worked. She and her husband Lester were American born. Lester provided for the family—for Dolly and the two boys. Dolly went to luncheons and played cards in the afternoons somewhere out of the neighborhood, but most of the time she went shopping for herself. So in the beginning, Dolly and Lester Rooney appeared to be further along than our family toward achieving the American Dream. As prudent as my mother was about money, Dolly was in the same degree imprudent. Mother furnished our home with all the essentials. Once an item was set in place, it was bolted there forever. But for Dolly, permanency was ephemeral. Dolly grew tired of her possessions, offering up small objects from time to time as presents for my mother. And my mother found a place for everything, winking to me, “Dolly is redecorating again.” In our home, Dolly's candy dishes and small porcelain statues and vases and china teapots and wall platters took on an immortality denied them upstairs on that conveyer belt of moving merchandise. “Lester earns a good living.” Her strong fingers work skillfully, pulling and twining the coils into a single thick chord. “Dolly buys on lay-away, and pays little by little. Sometimes when Dolly buys, she doesn't always pay. There, your braid is ready for school tomorrow.” For tomorrow, because my mother left for work every weekday morning before I awoke. The business went. The house was sold, and the baby grand piano. They moved into the apartment building, above our unit. By the time my mother finished telling me all this, I was disgusted with Dolly. The woman was no longer fun. 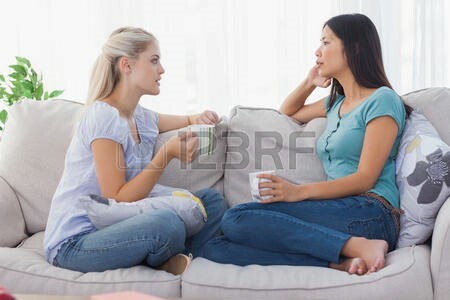 How could my mother respect her and remain friends with her all these years? Undoubtedly Dolly was merely a curiosity for her, an entertainment. But my mother wasn’t finished with the story. Lester, she said, went to his sister in the three-story house for help. He heard the elevator whirring. His sister came down; the wrought iron door folded into the wall; and she stepped out. He told his sister what had happened. In 1949, our family moved away, and one by one all the neighbors followed. Except for Dolly and Lester. They remained in their apartment as the neighborhood deteriorated. On Sundays, they drove away from the city and often found their way in their old Ford to suburbia and to our little tract house with the garden. They sat in our driveway on yellow canvas chairs and ate grapes from a large bowl. Dolly orchestrated the conversation with her robust humor and in her booming voice, watching my father puttering in the garage a few feet away, and my mother coming out of the house, hanging laundry and returning indoors for another batch. “Sam,” she didn’t go in for calling my father by his Russian name Sanya, “doesn't Rosie ever sit down?” she sang out as if it were a good joke. “I said, 'Sanya, you've got to do it. '” And she laughed with her bountiful American assurance. Lester sat, eating grapes from the bowl. As the seasons passed, my father, still young in 1951, but no longer young looking, slipped into the final winter of his disappointed life and died. And in the seasons following, my mother tried to be brave. She planned our first vacation, a trip to Las Vegas. I drove Lester’s old Ford. Lester sat next to me while Mother and Dolly sat in the back seat. “Dolly, are you going to gamble a lot of money?” my mother asked. “As much as I can, Rosie,” she sang out with gusto. I wanted to hear the answer to that. A moment halted in silence. Then my mother held up two ten-dollar bills and said, “These, I won't gamble away.” She placed them in her purse. “You see. I've just made twenty dollars.” Dolly roared with laughter. Soon after that trip, I learned that Dolly was borrowing money from my mother. Small amounts: five dollars, ten dollars, twenty dollars— “the twenty dollars I brought back from Las Vegas,” my mother winked at me. Dolly was prompt to repay. But then a measured time would pass, not much, and she borrowed again. Why did my mother continue to indulge this silly, selfish woman? Lester began to visit a psychiatrist. Mother told me he was receiving electrical shock treatments to block out parts of his memory. Paid for by his rich sister. Dolly’s income was suddenly and drastically reduced. What there was of it, her grown sons now provided. In the beginning of her widowhood, she continued to treat herself to lace slips in assorted shades, and replenish her perfume collection. She continued to borrow money from my mother. Since Dolly never learned to drive, the Sunday visits to our house stopped. So the two women continued to talk in the evenings by telephone. As the years passed and my mother worked during the day, Dolly began calling me. Full of her usual zest, she asked me anything, what I knew of the old neighbors. She simply wanted to talk. But I was going to college. My mother and I visited Dolly some time later. I had acquired a second-hand Chevrolet. The apartment was bare, as if she were moving out. Had she sold all of her possessions? But my mother was still there at night on the telephone, full of attentiveness. The two talked as if still in our apartment kitchen. Those in attendance at the graveside numbered eight people. They surrounded the plain casket decorated with a spray of white flowers. Some of the people sat, and some stood during the ceremony. Afterward, the people drifted away toward their cars. My mother had not moved; I waited at her side. A moment passed and my mother stood up and walked up to the casket. When she was close enough, she bent over and thrust her face into the flowers. She planted a kiss. The other day at the retirement manor, my mother and I were speaking of the past. And we spoke of Dolly. My mother surfaced from her old age, and winked, “You know, Dollytchka still owes me ten dollars. Evelyn's Blog for Sept 6, 2017 - FEEDBACK from a GOOD FRIEND re "Anna Karenina"
Your warning is so wise! I would like to continue the discussion a bit regarding Tolstoy's attitude toward women. This photo from the movie "The Last Station" is a blatant lie. The relationship between Leo and Sonya for many years had turned horrible. The student in the professor's class who walked out saying she did not like Anna Karenina was not objecting to Anna's love affair, I believe, so much as the morality of sacrificing a beloved child for the sake of that love affair. If Anna had not met Vronsky, she would undoubtedly have remained with Karenin. But a guy like Vronsky did come along, and Tolstoy understood the power of Vronsky to bewitch a girl. Tolstoy was older and toothless when he married Sonya, many years his junior. Tolstoy understood male animal power. Tolstoy wrote "War and Peace” before “Anna Karenina”. Still high on the adrenaline of writing about the Russian soldiers pushing back and destroying Napoleon, he reached back to his WILD soldiering days, his days of "sowing his oats" of his early novel “The Cossacks” and found Count Vronsky. I bet Tolstoy WAS Vronsky. Tolstoy understood him and was empathetic when Vronsky returned to soldiering, drinking, gambling, and womanizing. Tolstoy was clearly a literary genius gone off the tracks after the Anna novel! His later works were progressively dark and depressing. Sick. “War and Piece” (in three volumes; don’t cheat yourself because it’s all unbelievably the best there is in world literature) is an experience of a lifetime. Tolstoy was at the height of his genius, researching the war for 8 years, reading everything about it, before writing one of the greatest works in all literature. Soon after, still in his genius mode, he wrote “Anna Karenina”. Many excellent film versions of "Anna Karenina" have been produced. My personal favorite starred Greta Garbo and Frederich March. Evelyn's Blog for Aug 30, 2017 - "Must I "LIKE" Anna Karenina? So when contemporary writers out in the working world, especially mainstream writers, said my readers must LIKE one of the characters, I was shocked. Since then, I have heard it everywhere by everyone in the general public arena. And I thought I should accept LIKEABILITY as a tool in my writing. But I always thought I was pandering rather than serving art. I caved. Good enough. Then this morning I heard on TV an op-ed commentator discuss Leo Tolstoy’s great novel “Anna Karenina” and I experienced an AHA! moment. I agree. I understood Anna’s vulnerability to being bewitched by the dashing count who nourished her starved emotions. I understood her dilemma of having to sacrifice her son. She was caught in a situation where there wasn’t a satisfactory solution. As you recall, Anna is forced to give up her young son to run off with her lover Count Vronsky. She is unable to take her beloved son with her. She must leave him with the father, a cabinet minister who is an insufferable man, cold, rigid, unloving. Society turned against her, shunned her for her abandonment of her family. The injustices visited upon Anna still disturb me. She does commit suicide in the end, if that’s any consolation to some readers. I disliked Anna’s husband. I understood Anna’s vulnerability to being bewitched by the dashing count who nourished her starved emotions; I understood her dilemma of having to sacrifice her son. She was caught in a situation where there wasn’t a satisfactory solution. The novel was published in 1877. It lays out the injustices a woman faces trapped in a society that would keep her in a bad marriage. In today’s society, Anna could have left her husband and taken the boy with her. As you recall, Anna is forced to give up her young son to run off with her lover Count Vronsky. She is unable to take her beloved son with her. She must leave him with the father, a cabinet minister who is insufferable, cold, rigid, unloving. Society turned against Anna, shunned her for her abandonment of her family. The injustices visited upon Anna still disturb me. She does commit suicide in the end, if that’s any consolation to some readers. She throws herself under the train tracks. Evelyn's Blog for Aug 23, 2017 - DID YOU GET THE JOKE? My last blog (Aug 18) was about the never-ending and imperfect task of editing. In other words, My blog "repeated" the THE STORY OF THE BLIND MAN. Does that make the point strongly enough!!!! I always gaze at pictures of a person reading a book and imagine that person is reading one of my novels. 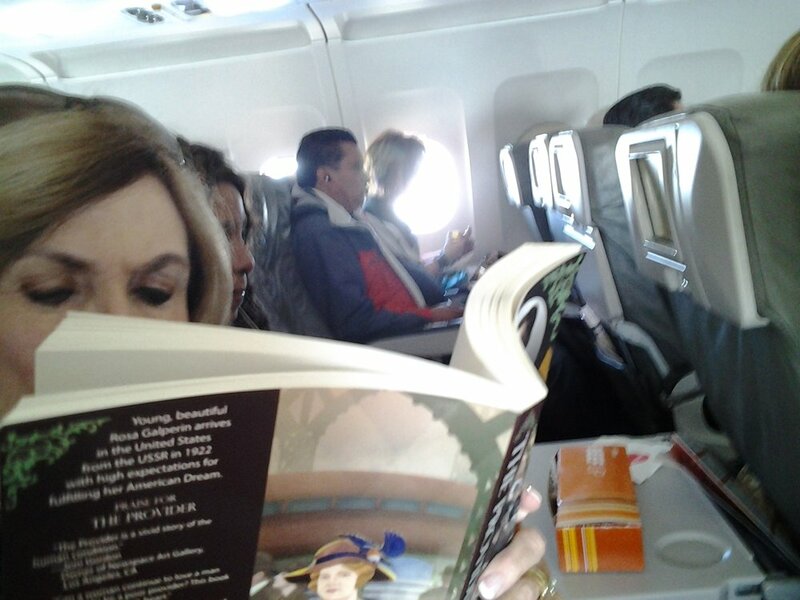 This gal is reading CONCERNING GEORGIA STEKKER. She is reading THE ROMANTIC IMPERATIVE. The story goes like this. Oscar Wilde ("Portrait of Dorian Gray" and" Importance of Being Earnest")spent an entire morning editing a poem. By the end of the morning, he had removed one word, "and". After lunch, he returned to his editing. By the end of the afternoon, he returned to his editing. By the end of the afternoon, he had put back the "and". It was a typical day at work. In my own case, I just stop at some point, knowing that another re-read will bring further changes (in taste, judgment and proportion). My God, I have only one life. Here's another way of thinking about writing. I once shared THE STORY OF THE BLIND MAN, but now I bring it back to you with a new question. 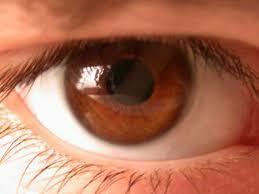 A blind man in Glasgow, Scotland, was sitting in a public square with a cardboard sign that read, "I'm blind. Please help." A young woman walked by and changed the words on his cardboard sign. Soon many coins were heard being dropped into the can. QUESTION: Would you have known how to edit the sign?" A blind man in Glasgow, Scotland, was sitting in a public square wth a cardboard sign that read, "I'mblind. Please help." Not many coins were tossed into his coin can. A young woman walked by and changed the words on his cardboard sign. Soon many coins were heard being dropped into his can. QUESTION: Would you have known how to change the sign? NOTE; The age-old question is this: Does faction writing come with one's genes or is it learned? During one of my recent impersonations as an insomniac, (I’ll never give in), I found myself watching Diane Keaton in “Baby Boom” and I recorded the film for my husband Marv, although I worried that he might find it too much of a woman’s film. He loved it. Aside from Keaton’s comedic talents (which were hilarious), I was taken with the performance of this guy named Sam Shepard. I was amazed at his bull’s-eye performance. It was so natural that it was extraordinary. He didn’t seem to be acting at all. This was verified on a Youtube testimonial from Jason Alexander (of “Seinfeld” fame) who raved that Shepard was the BEST actor he ever saw. I watched “Baby Boom” again, verifying Shepard’s technique. I found out more about Shepard. He was a Pulitzer Prize winner, and author of more than 44 plays mostly off-off-Broadway. He was a leader in the last half-century new movement of playwriting. How did I let him slip through? The aficionados knew about him, followed him, highly respected him. And then the other day Sam Shepard died. I began reading his Pulitzer Prize winner that brought him to fame on Broadway: “Buried Child”. I wrote a review on my i-pad for Amazon and regretted every word of it. I wrote, “Who wants to read about such sick ugly characters? I would not want to know any of them personally.” Fortunately, my submittal click did not work. Why am I glad that the review disappeared? Because in the newspaper the other morning I read a long article about the decline of Middle America. Young people feel stuck and find a an unrecognizable landscape, a fgorgotten American Dream. They reach for it and its resources, but all is unrecognizable and gone. My God, this is “Buried Child”. The disappearance, the hopelessness, the sickness that feeds on itself and turns incestuous. Shepard wrote it all in this searing play, which is considered the culmination of all of his family plays. His pen was on the pulse of Middle America. He wrote in symbolism, in metaphor, in surrealism, in realism. It’s not only Middle America— It’ll shock you. On to something less bleak. Edith Wharton’s 1920 novel, THE AGE OF INNOCENCE. Here is one of my favorite authors and favorite novels. It is an expose of upper class mores. Even though of a different time, this is the human condition written large. (Daniel Day-Lewis, Winona Ryder, and Michelle Pfeiffer). The writing is filled with wit, and the voice is elegant. Day-Lewis’scharacter is nurtured in an unfulfilling but dutiful life, and in the end, oh that end (no spoiler), read it for yourself. · Martin Scorsese directed it when he was 34 years old. It is a complete departure for him. It was an elegant expose of the morals of the 1920’s in high New York society. Scorsese dedicated it to his father Luciano Charles Scorsese.. It was a work of love, and exquisitely detailed. Everyone was shocked that Scorsese could pull of such a tour de force. I hope you read my last blog (with the photo of the pug): “THE NEW YORKER REJECTS ITSELF; A QUASI-SCIENTIFIC ANALYSIS OF SLUSH PILES”. Now I have a treat for you: the perfect follow-up in my own life— a “beaut” of an example of critics at their worst and best. I had forgotten that I also had sent this same excerpt to a much more significant Jewish site: JewishFiction.net — a powerhouse with a prestigious Advisory Council and a formidable panel of seven highly-credentialed reviewers for each entry. I just received their response: “A fine excerpt that we wish to publish.” I signed the contract. In addition, I always keep in mind what Jonathan Franzen (author of “THE CORRECTIONS” – National Book Award 2001) wrote to me: “If it’s not fun, then the hell with it.” Oh, it’s so much fun! By the way, take a look at my Amazon/Author page. You’ll see my whole enchilada. SO LADIES & GENTS, why do we authors continue to write? As Jonathan Franzen once wrote to me, "If it's not fun, then the hell with it." 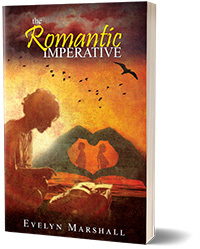 THE ROMANTIC IMPERATIVE is now on Amazon, at home with my other titles. It is the first of my novels to be published only as an ebook. Let's see how it goes. My paperbacks are passed along free from person to person, and I have no way to know how many people are reading them. A review on Amazon would compensate the author, even if a friend received a passed-along free copy. My six reviewers were real troopers: Arlene Germann, Andrea Tabor, Lisa Sandoval, Bonnie Sanabrais, Linda Allison, and Alma Herman. Thanks you again very much. 1. The original title was THE ROMANTIC IMPEDIMENT. But my editor, Trai Cartwright, believed that IMPERATIVE was more palatable, even though the first title was more to the point. After the title was set in stone, I reconsidered - too late. With IMPERATIVE, the read expects a walloping, gushy romance dripping off the page from first to last. But didn't do that because I don't write romances. I write love stories, and variations on the theme thereof. 2. The novel has imbedded in it three of my short stories. You can find them easily, if you haven't already. Let me know, and I'll tell you if you're right. In 1925, an uncle marries his niece (an Avunculate Marriage). They have 2 children, the first normal, the second vastly retarded. In 1935, during the Great Depression, the father takes the now 6-year-old retarded child in the car with him. The garage door is closed. He starts the engine. The novel is short, but not a novella. It's long enough. I'll write to you more often, and hope to hear from you. Even before the novel is out the gate, it garnered a Finalist Award for Literary Fiction from the 2017 International Book Award contest. I entered this contest once before in 2012 for THE PROVIDER and won the same award. After 2012, I never entered a contest again, hoping to connect with a literary agent. That goal was never met. Worry not! I am in some stellar company, even with great writers who never won awards. A word about THE PROVIDER. Last year, I heard Senator George Mitchell in an interview talking about his father. The story went that his father was a manual laborer who managed to support a large family well enough. But when he was 50 years old, he lost his employment and was devastated. He was so depressed that the family almost fell apart. A year later, he found employment as janitor and his self-esteem was restored. Senator Mitchell realized how important work is to a man's dignity. 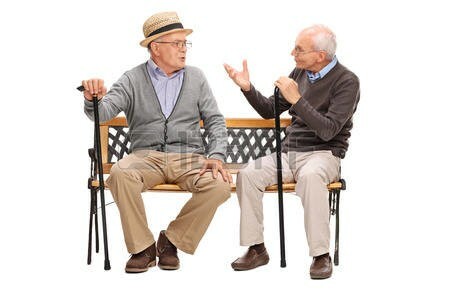 Recently, NORMAN LEAR was interviewed and spoke of his childhood during the Great Depression where the common expression was "Be a good provider." 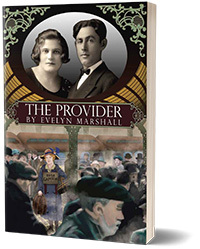 To both men I sent a copy of THE PROVIDER with an inscription, "To resonate in the heart." So long for now. I'll be talking with you soon again. “TOSS OUT SACRED COWS.” William Faulkner said this. His point was that if a piece distracts or does not really advance the plot and characters, then out it goes. I have followed Mr. Faulkner’s advice. I tossed out the Prologue to THE ROMANTIC IMPERATIVE. I love the piece, and sharing it with you here brings me some comfort. (It will be of particular interest to my testimonial gang.) Of course, I saved the last four lines and they became the first line of the novel. She knew that presidents of countries kept diaries. For posterity. Vida Cleary was not interested in posterity. She knew that common people relied on diaries to escape their painful real world. Vida’s real world was not painful, and she was not common. Diarists confided their loneliness. Vida was not lonely. She would not use her diary for the typical melancholy reasons of other romantics, because Vida was not a typical young romantic. The mundane was not for her, such as “It rained today and that depressed me,” or “My soul is in a state of yearning.” Instead, she would document her revelations as a female of the species. Besides, it was writerly to keep a diary. Like many other precocious children, by the age of three she could read. By four, she was reading books. Soon enough she thought of herself as exceptional, and that was the thinking that careened her toward her romantic elitist ways. By thirteen, she was fully engaged with the great romantic novelists of literature. Her first revelation quivered under its own weight, ready to burst out of her mind. It was the reason she thought about having a diary at all. Vida’s purchase was bound in synthetic green leather. It carried three locks, enigmatic in aspect, yet unlike the sinister-looking diary next to it with leather straps. And it was cheaper. No matter that the key didn’t work. The locks made a lovely click. She brought the diary home, into her large spare bedroom, and closed the door. She pulled her chair close up to her desk, sat down, and switched on a pool of light from the desk lamp. Afternoon shadows hung heavily in the surrounding air. She turned the diary cover with its three locks to the left and listened to its faint flapping sound against the desktop. Aware of the solemnity of the moment, even its piety, she brought her fountain pen gorged with black ink to meet the first silky page. She wrote slowly, carefully. She fell back on her bed, satisfied. She was fourteen years old. She would not write another entry for thirty years. So now I wonder if my testimonial gang on the novel will tear into me for omitting the Prologue. I hope to hear from them about it. I will report to you their cuss words. In the meantime, we’re waiting for the formatter to do her work on THE ROMANTIC IMPERATIVE and then put it up on Amazon-Kindle. Very soon, I will send you another blog, a short one. While I'm waiting-waiting-waiting for my formatter to start work on THE ROMANTIC IMPERATIVE (middle of May 2017) for Amazon-Kindle, I came upon the most uncanny quote from Jane Campion, the producer/director/writer of the extraordinary New Zealand film "The Piano". Wikipedia: The Piano is a 1993 New Zealand drama film about a mute piano player and her daughter. Set during the mid-19th century in a rainy, muddy frontier backwater town on the west coast of New Zealand, it revolves around the piano player's passion for playing the piano and her efforts to regain her piano after it is sold. The Piano was written and directed by Jane Campion, and stars Holly Hunter, Harvey Keitel, Sam Neill, and Anna Paquin in her first acting role. The film's score for the piano by Michael Nyman became a best-selling soundtrack album, and Hunter played her own piano pieces for the film. She also served as sign language teacher for Paquin, earning three screen credits. The film is an international co-production by Australian producer Jan Chapman with the French company Ciby 2000. The Piano was a success both critically and commercially, grossing US$140 million worldwide against its US$7 million budget. Hunter and Paquin both received high praise for their respective roles as Ada McGrath and Flora McGrath. In 1993 the film won the Palme d'Or at the Cannes Film Festival. Subsequently, in March 1994, The Piano won 3 Academy Awards out of 8 total nominations: Best Actressfor Hunter, Best Supporting Actress for Paquin, and Best Original Screenplay for Campion. Paquin, who at the time was 11 years old, is the second youngest Oscar winner ever in a competitive category, after Tatum O'Neal, who also won the Best Supporting Actress award in 1974 for Paper Moon, at 10. In closing, I must encourage you to see this extraordinary film while waiting for THE ROMANTIC IMPERATIVE to be posted on Amazon-Kindle. I loved this film, partially because my first love was the piano. My second love, for the last thirty years, has been writing fiction. I'll be back very soon with another short blog.